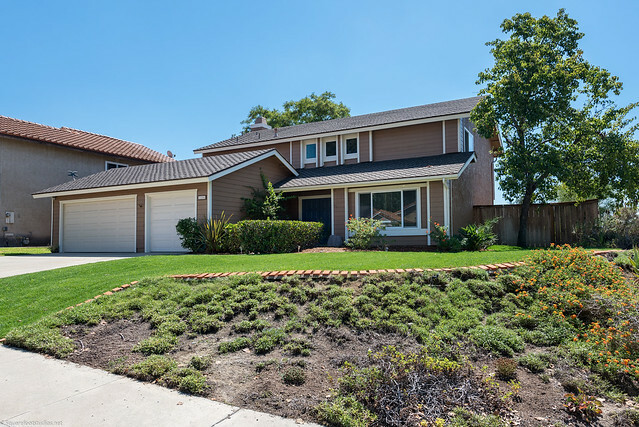 Remodeled home located on a great corner lot, & walking distance to Lake Miramar. This clean, turnkey home features gleaming cherry hardwood flooring, new windows, remodeled kitchen and bathrooms, built-in cabinetry in family room, custom fireplace and fresh paint throughout. Private backyard with large covered patio, and multiple fruit trees. Scripps Ranch Racket & Swimming Club membership conveys with the home. No HOA or Mello Roos. As soon as you enter the front door you will be welcomed into a spacious formal living room and dining room with gleaming cherry hardwood flooring. The upgraded kitchen features granite counter tops, Stainless steel appliances, gas cooktop, and convenient opening wall to the dining room. You will enjoy the built-in entertainment center in the family room as well as the gorgeous fireplace surrounded by Travertine stone. The downstairs also offers an adorable powder room and large laundry room with direct access to the backyard. Upstairs features 4 generous sized bedrooms. The master suite has an elegant bathroom with extra large shower, tub, two vanities & walk-in closet. The 3 other bedrooms share a large remodeled bathroom. You will enjoy the private and quiet backyard. Relax under the patio or mature trees and enjoy the multiple fruit trees, including fig, lemon, lime and avocado.